This might be the most exciting news to come from the Gilmore Girls revival since it was announced that four 90-minute episodes will soon debut on Netflix. Thanks to Entertainment Weekly, there are new Gilmore Girls photos for fans to theorize (and probably sob with excitement) over. As you can see below, these four particular photos showcase a lot of spoilers. First, in what is a wondrous sight, Luke and Lorelai are holding hands. *sigh* They never fail in making my heart feel so much happiness. Clearly, they are still together eight years later and even blissful, based on Lorelai’s smile. Also, let’s observe how Luke is still wearing that famous blue hat. Yeah, he still rocks it. So, all is right in the world. Luke and Lorelai are still going strong and probably married, right? Nope. They are definitely not married. According to EW (via TV Line), Luke and Lorelai are not married in the revival — at least for now, that is. Before fans start freaking out, this doesn’t mean that they won’t end up tying the knot. Remember, the new episodes are said to feature a wedding. So, maybe Luke and Lorelai will finally have that wedding they were supposed to have in Season 6. I know, I know. It’s kind of frustrating that these two still haven’t said I do. That’s all most fans have wanted ever since the series began and proved that they belonged together, right? Well, as frustrating as it may be, the two not being married isn’t necessarily bad. They’ve never had a traditional relationship, so them not taking the next big step isn’t that surprising. Plus, seeing how their first engagement went down, maybe there is some hesitation and fear remaining. Maybe they are also just taking things slow and savoring the moment before walking down the aisle. Who really knows, but let’s also keep in mind that even though they aren’t married, they could very well be engaged. As much as I’d love to see them married, if they are together, happy and head over heels in love, that’s all I care about. Now, let’s check out these other photos. Aren’t they just glorious? First, let’s discuss how beautiful Lauren Graham and Alexis Bledel are. They haven’t changed a bit and still possess the charm of the beloved mother-daughter duo they exceptionally portray. So, it looks like Rory is embracing her hippie side with that outfit, and totally rocking it. Also, is anyone else freaking out that there is going to be a Stars Hollow: The Musical? If you haven’t heard, EW also revealed that Sutton Foster will sing in the musical, alongside Smash’s Christian Borle and Disaster!’s Kerry Butler. As for Rory’s career, is she now a teacher? Based on the chalkboard, there are Jane Eyre notes, which just might mean she is teaching English. If you’re disappointed in the fact that Rory took a very different career path than you originally thought, this photo doesn’t necessarily mean she is a teacher. Maybe she is a killer journalist who came in to speak in a class — and hopefully one at Chilton. Finally, there is Emily, who is now a widow. It’s definitely heartbreaking to think that Richard (Edward Herrmann) won’t be part of the revival, but he will surely be there in spirit. I have no doubt that Emily will continue to rock it, even without Richard by her side. 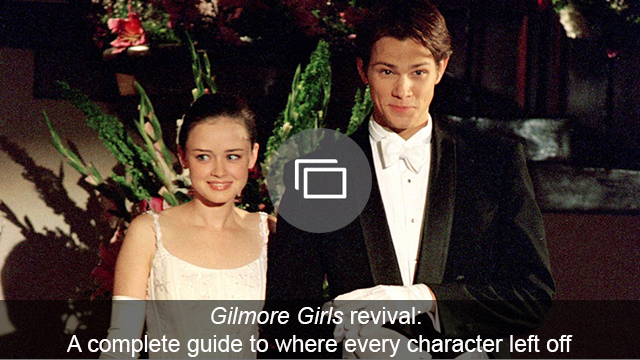 So, who else is now even more excited for the Gilmore Girls revival? I think I need a cup of coffee to calm me down.